My father told me that when he moved to Cleveland in the 1930's he first lived in a boarding house run by Fred and Dorothy Goodsmith. All the boarders gambled and bet on horses. My father said that when they played gin rummy and Fred was about to go gin he would always give it away by starting to whistle the same tune every time. One day my father went for an eye examination, but the rest of the boarders thought he went to the track. When he came home he said, "Great news! I had 20-20 vision!" Someone looked up and said, "Oh yeah, so what did he pay?" In 1930 Fred and Dorothy were at 2310 Selzer Ave, but this didn't ring a bell with me. However in the 1939 to 1943 city directories, their address was 1917 E. 75th. This was the area of town that I associated with my father's early years in Cleveland. So it was with some satisfaction that I found that address in the 1940 Census and saw that the whole crew was living there: my father, Fred, Dorothy, and an old racetrack friend of my father named Bill Middaugh. Fred was born in Newburgh on Oct 9, 1884, the son of F.J. and Catherine (Delfing) Goodsmith. Dorothy Jacobs was born October 25, 1893, in Dayton, Ohio, the daughter of August Jacobs and Susan Taylor. Fred had two children by his first marriage to Gertrude Egert. They appear to be separated by 1918 and were divorced in February 1921. Fred and Dorothy were married that June. They had no children. By 1918 Fred was in the restaurant business, working as a proprietor for an Anthony Cartwright at 12814 St Clair. He apparently remained in this line of work until his death; all records call him an employer, proprietor, etc., and list his places of business as lunch rooms or restaurants. Occasionally on the records, he or Dorothy gave their employment address as their residence. Fred was still at 1917 East 75th in 1942 when he registered for the World War Two Draft, but died in Georgia on 8 Oct 1944. Dorothy died "suddenly in Florida," her death notice appearing in the Cleveland Press on Dec 17, 1952. She is buried in Hillcrest Cemetery, Bedford Heights. I couldn't find Fred's burial location. My thanks to the maintainer of the garym28 database at rootsweb, for pointing me toward Fred's death date. 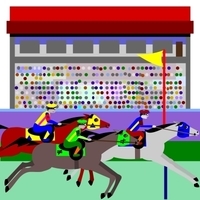 The horse racing drawing is courtesy of debspoons at freedigitalphoto.net.